The workings of the Balanced Movement Mechanism™ Balance is the best starting point for movement A centrally placed tilting point intuitively keeps you in balanced and continuous motion. As the seat and the backrest are linked together, the seat front rises when you lean backwards and stimulates your ankle movement. The seat lowers as you lean forward to work. Keeping you awake, alert, collected, creative, animated… All that you have to be during a workday. Casual For you who feel at home at work. 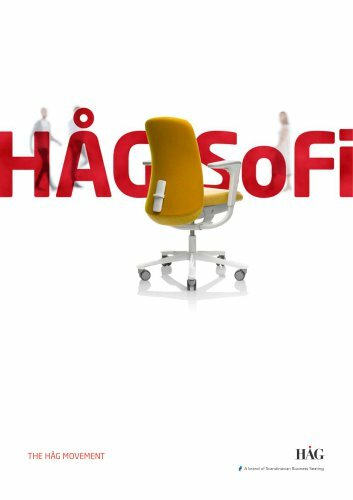 The casual HÅG SoFi is for the informal work spaces. Using soft toned textiles and with subtle contrasts creating an unpretentious atmosphere, an overall comforting and likeable expression. Stands out and Fits in. Whoever you are, whatever your needs – prepare for a small revolution. Attract, captivate, inspire. The HÅG SoFi is designed to be customised. Ranging in appearances from subtle, refined and coherent to expressive and daring. There is a wide variety of models, materials and colours to choose from and combine. Formal HÅG SoFi is striking and timeless in a conservative cut. In this clean and coherent appearance, surfaces, colours and details connect to blend in or to make an impression. Always creating a captivating look. Edge This HÅG SoFi makes a statement. A fashionable look for the colourful work environment, trendy and a bit daring. HÅG SoFi – a chair that surprises, using contrasting colours to accentuate details and lines. With a playful attitude it challenges and inspires. To be seen, felt and sensed – HÅG SoFi is a visual, tactile and animating up-close experience. Subtle and refined appearance. Coherence in materials and colours. Perceived quality through tactile surfaces. Inviting, generous volumes, inner adjustable lumbar support, rich contact surfaces. Shapes are carefully designed from all angles. Visual balance between backrest and armrests.